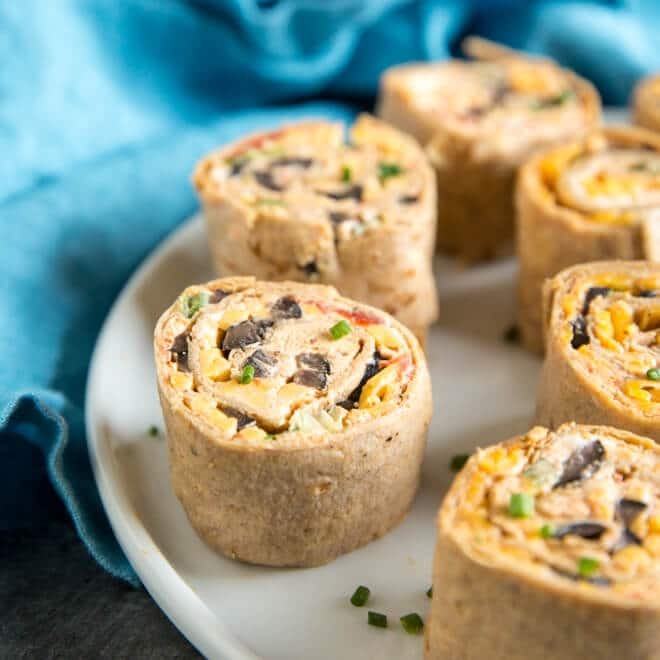 Vegetable Tortilla Roll Ups with cream cheese filling spread on tortillas, topped with veggies and cheese. Slice and serve. Just like veggie pizza! Scroll down for an easy video tutorial. I’ve always loved Vegetable Pizza. It’s fun to make and, more importantly, fun to EAT. But, it doesn’t always travel easily. Best case scenario: You will find yourself stacking tiny, tasty squares of veggie pizza into a shoe box lined with wax paper or something. Worst case scenario (and I’ve done this): You walk into a party with a baking sheet full of cooled crust and tubs of prepared ingredients, trying to recruit volunteers to help with assembly. I knew there had to be an easier way to share the joy that is Vegetable Pizza. So, I took the basic concept and spread it on a tortilla instead. Then, I rolled it up and sliced it. Your creamy base is that classic, eternally delicious blend of cream cheese and mayonnaise. I don’t say this a lot but… it’s okay to sub lower-fat counterparts for either one. Or even both. Have at it. 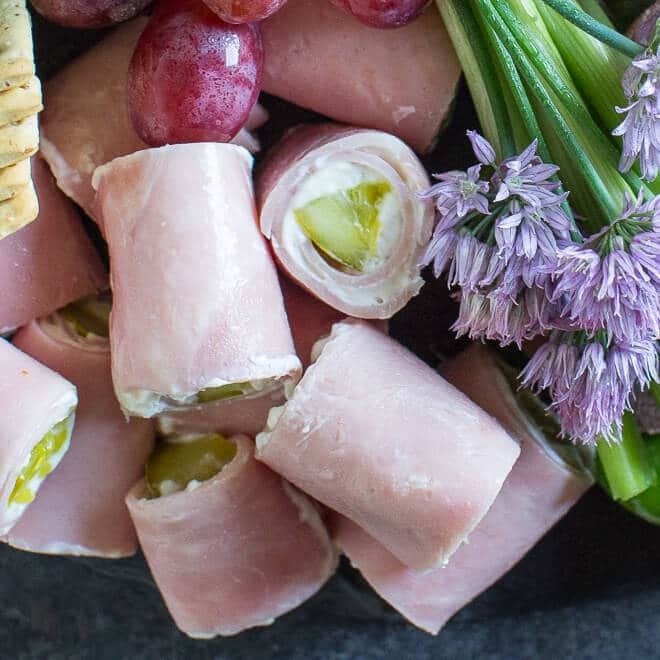 These roll ups are appetizer perfection even with low-fat dairy. Next, stir in ranch dressing mix. I like to make an easy homemade blend, but it’s perfectly fine to use the store-bought packets instead. I like the classic combo of broccoli, cauliflower, carrots, and shredded cheese on my Vegetable Tortilla Roll Ups. Other good vegetables include cucumbers, tomatoes, scallions, bell peppers, and even black olives. A 12-ounce bag of broccoli flowers, cauliflower florets, and baby carrots are exactly the right amount for this recipe. So if you like to buy convenience, that will cut down on your prep time. You could also use shredded carrots. The trick is to not overfill the roll ups. Your temptation might be to layer on everything you can find, but too many vegetables create pockets of air in the roll ups and they don’t hold their shape. If you start slicing (after the 2 hours of chilling time) and you find pockets of air and your veggies are falling everywhere, don’t worry! Just unroll your tortilla and re-roll it, pushing down to make the roll tighter and fill in those pockets. These roll much easier after they have chilled. You can make these roll ups a day in advance and keep in them in the refrigerator, wrapped individually in plastic wrap. They are a dream to take to a party! Just slice and serve. Save this Vegetable Tortilla Roll Ups to your “Appetizers” Pinterest board! 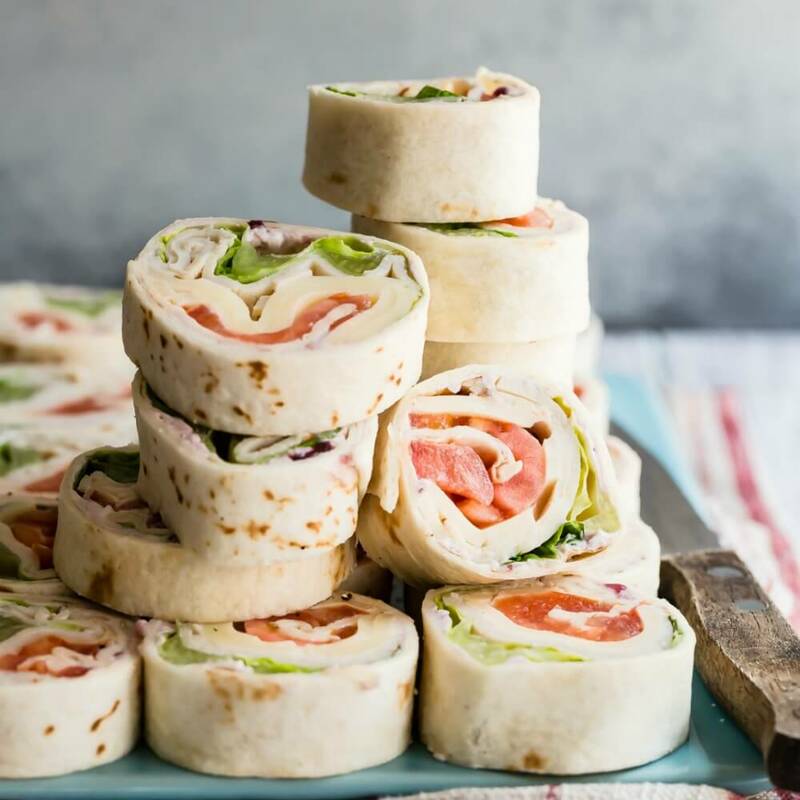 Vegetable Tortilla Roll Ups with cream cheese filling spread on tortillas, topped with veggies and cheese. Slice and serve. Just like veggie pizza! In a medium bowl, combine cream cheese, mayonnaise, salad dressing mix, and dill weed. Working with one tortilla at a time, or working an assembly-line fashion, spread about 1/4 cup of the cream cheese mixture evenly over each tortilla, going all the way to the edge. Divide vegetables and cheese evenly over tortillas. Starting at one end, roll each tortilla tightly and wrap individually in plastic wrap. Chill at least 2 hours before slicing. Slice each roll up into 8 pieces. If the roll ups seem loose when you start to slice them (you see pockets of space or the vegetables seem to be falling out), feel free to unroll the tortillas and re-wrap them tightly. Reduced-fat (Neufatchel) cream cheese and/or light mayonnaise may be substituted for the full-fat dairy products. 5 (10-inch) tortillas may be substituted for the 8 (8-inch) tortillas. Adapted from my Vegetable Pizza recipe. it’s a great idea for an office snack indeed. and they’re so easy to make… nice! I made the veggie roll ups tonight. They were a HUGE hit! Next time I’m going to add crab meat too! Hi Meggan, crab would be wonderful with this delicious! Hi Cheri, you are the second person to mention that! 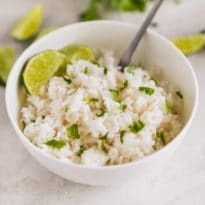 Does a recipe exist somewhere out there that is like this but with crab? Clearly I need to get cracking on that. Thank you so much! hi – if i were to add powdered buttermilk, it would not be considered vegan, correct? Hi Holly, you’re right. Powdered buttermilk is made from regular milk. I’m sorry about that! Can you use Greek Yogurt instead of the mayo or cream cheese? Just trying to see if this could fit into my diet! Sure, you can definitely try it! I haven’t tried that myself. I imagine it would change the texture of the spread a lot, but if you like the taste, there’s no reason not to do that! Would they be ok with cooked veggies? I think they’d be fine! Maybe less crunchy? Slightly less crunchy? I think I am used to the flavor of raw veggies in Vegetable Pizza, but I can’t see any reason why you couldn’t use cooked. As long as they aren’t soggy, I think you’d be fine. I’ll let you know. Thinking I will make them for my daughter’s party next weekend. Thank you!! I made the spread, but instead of using tortillas, I filled mini baked phyllo pastry cups and then topped with veges and cheese. They were really cute for a wedding shower! I made these back in May and everyone at work liked them and wanted the recipe !! Making them again today and it reminded me I should post on your blog ~ great, love ’em. 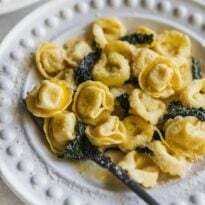 I did try something that was not successful, at least for me – I froze some and when I took them out a month later they were squishy and soggy, ugh – I was so disappointed that it didn’t work to freeze them. Thanks for the great variation on veggie pizza. Hey Joyce! Thanks so much for 1). trying my recipe and 2). reporting back! I am so sorry to hear that freezing them did not work. I have some other ones, Mexican Pinwheels I call them, with a cream cheese/shredded cheese/green chile/black olive filling. Those freeze well. In this case, I’m guessing the vegetables had too much moisture and led to the soggy mess. So disappointing! I will definitely update the post with that info so no one else has to be disappointed. Thank you so much again for everything, and I’m glad these worked for you! how long can I keep them in the fridge? Hi Nadia, 3 to 4 days would be fine. I hope this helps. Thank you! Hi Divya! You can skip the mayo. If you do, it will basically be like a flavored cream cheese which is good. The mayonnaise just makes it easier to spread, so you’ll have to be patient with yourself if you leave it out. If your cream cheese is quite soft, you should be okay. The purpose of the ranch powder is to flavor the cream cheese, not hold anything together. I hope this helps! Thank you so much for your questions. And Happy Birthday to your little one! Take care. It is 12/22 and tomorrow I’ll be making veggie pinwheels for the 24th. Please give me some advice. I was planning on using the spreadable garden and veggie cream cheese. I was going to add some finely sliced scallion, finely chopped celery, red bell peppers, chopped black olives and cheddar cheese. I was going to mix everything together then spread on tortilla. Do you think this might work if I drain everything well? Also you wouldn’t add ranch dressing to the garden/veggie cream cheese? Please, please get back to me as soon as you can! I know you’re busy but please try. Hi Lynn!! If you are using the garden vegetable cream cheese, that is plenty of flavor and you can skip the ranch packet. This all sounds great and you should be just fine! Roll the tortillas and chill them, and if they seem to loose, just re-roll them while they are chilled and remove all the space and it should work great. I hope I got back to you in time! Thanks for your questions! Oh Meggan, these are so good! Just made these for New Years Eve party tonight. I couldn’t keep my kids out of it!!! It is great fresh out of the mixer cant’ imagine the flavor once everything “marrys” together!!! The only thing i changed was i blended everything together, just to save a step, for times sake. Still tastes amazing! Thanks for a new family favorite!!! Hey Nicole, I’m DELIGHTED to hear that! It makes me want to make them tonight for New Year’s, I might just do that! I love the idea of blending it all together. That does sound easier and probably doesn’t affect the outcome at all. Might even make them better! Thanks so much for your comment. :) Happy New Year! I used half a package of broccoli slaw and chopped it a few times, and forgot to add the cheese and it was still well received. Will make this again for sure. Maybe even without the mayo this time and add in the cheese. The broccoli slaw idea is genius! And yes, it’s still good without the mayo. I just love mayo. So glad this was a success for you! I appreciate that you left a comment, that’s so thoughtful. Take care! Could these be made without the dill, not a fan of dill? Hi Joyce, yes absolutely. Just leave it out! If there’s something you prefer in it’s place, like chives, add that. But it’s plenty flavorful on its own without any additional fresh herbs. Thank you for your question! These sound like the perfect snack to take to our favorite swimming hole. Out here in the country, we like to go to our friend’s property that has a swimming hole (or pond, or man made lake, or whatever you want to call it) and everyone always brings a snack for the snack table to share. I’m always on the lookout for something new to share. This may be a silly question, but when I roll them up, do I really just roll from one end to the other, or do I roll it like a burrito? If it’s not rolled as a burrito, what do I do about the ends? Do I close the flaps at the end before refrigerating, or do I just leave it open and refrigerate? Thanks! Hi Athena! Just roll it from one end to the other. The filling will make it stick to itself. I hope that makes sense! Thank you!